Special offer for $10 printed models applies for limited time. Offer includes basic 3D model work, charges may apply on any additional 3D model prep. Offer may expire due to limited material, time, or availability. Prices range at $10 arches to $50 Study Models plus any additional model work costs that are needed. Advertised price does NOT include shipping, delivery is free for local doctors in the Salt Lake City county. Seven day turnaround does NOT include 3D models, actual turnaround times vary depending on material, time, or availability. Sing up by February 2, 2018 to lock in your price!! 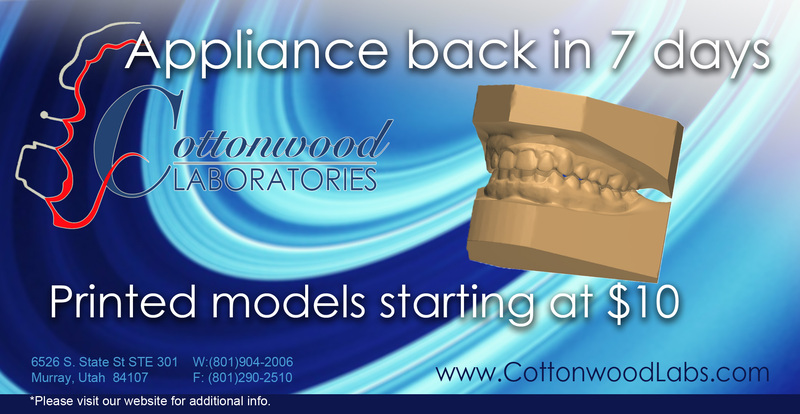 Cottonwoods Labs M.A.A is covered under Cottonwoods Year warranty, Guarantee for a Perfect-fit and to arrive On-time!